The rack mounting kit consists of adapter brackets, rear braces, shelf rails, cage nuts, and screws. Caution - The server weighs about 180 pounds (100 kg) when fully loaded with components. To reduce the risk of serious personal injury or equipment damage, use a mechanical lift to install the server into the rack. If a lift is not available, remove components as described in How to Remove Components to Reduce Weight. This reduces the weight of the server to 80 pounds (45 kg). Always load equipment into a rack from the bottom up so that it does not become top-heavy and tip over. 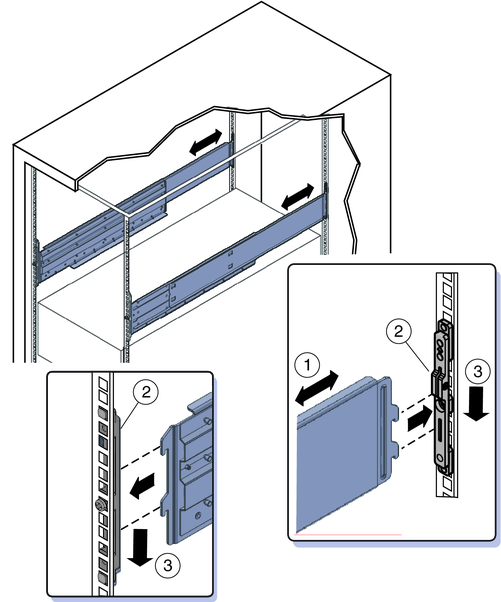 Deploy your rack’s anti-tilt bar to prevent the rack from tipping during equipment installation. 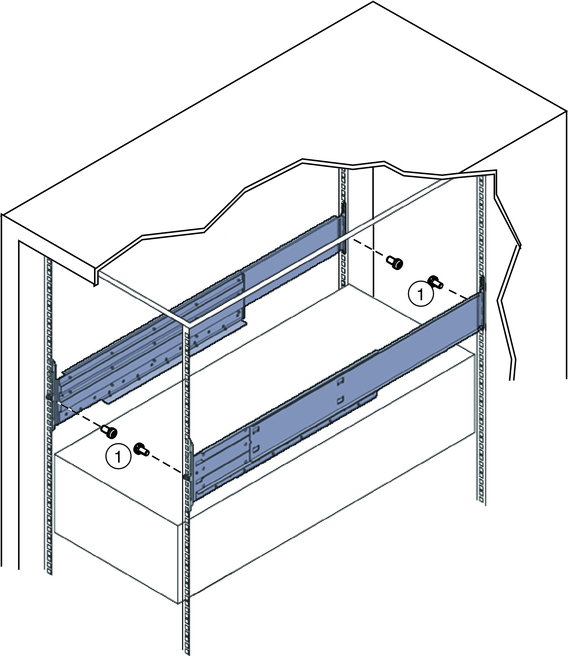 Note - To install rack mounting hardware in square-hole racks, see How to Install the Universal Rack Mounting Hardware in a Square-Hole Rack . Gather the necessary screws and connectors. Verify that you have a 5RU space in your rack. Select the set of adapter brackets for round-hole racks. 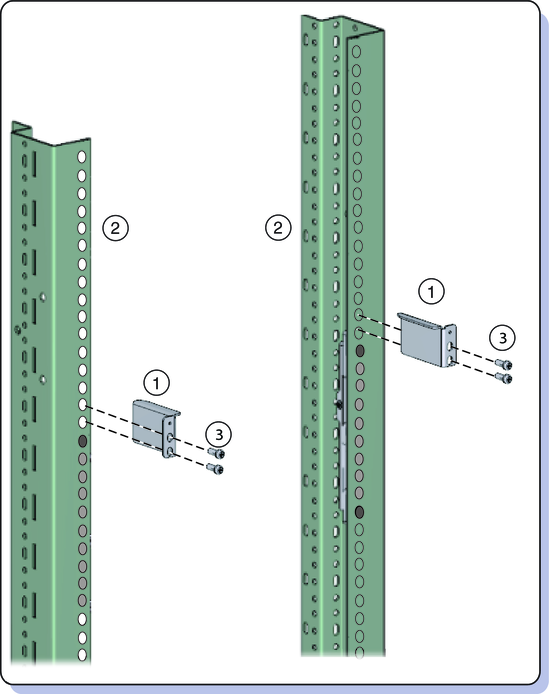 The server ships with two sets of adapter brackets: one for racks with square holes (1), and one for racks with round holes (2). The adapter brackets for square-hole racks (1) have threads. The adapter brackets for round-hole (tapped) racks (2) do not. See the following figure. Note - Arrows on the adapter brackets (3) indicate how they should be oriented. Be sure to install all brackets with the “Top” arrow (3) pointing up. Attach the adapter brackets to the front posts. Place the adapter brackets so that the bottom of the adapter bracket is aligned with the bottom of the (5RU) space where the server will go, and that the arrow labeled “Top” points up. Use three M6 x 12 or 10-32 x 10 shoulder screws for each side. Pass the screws from the inside of the rack, through the adapter bracket, and into the threads on the post. Note - The accessory box includes a printed template that you can use to help align the adapter brackets. Attach the adapter brackets to the rear posts. Pass two screws (1) from the inside of the rack, through the top and bottom holes in the adapter bracket (2), and thread them into the post (3). Note - Do not use the center screw in the adapter bracket. 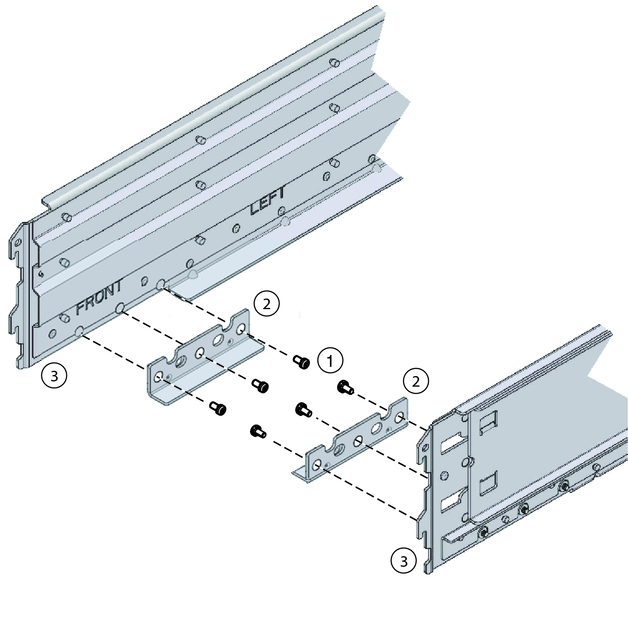 It is reserved for the optional shipping bracket kit described in Installing and Removing the Universal Shipping Brackets. For M6 racks, use two M6 x 12 screws per side. 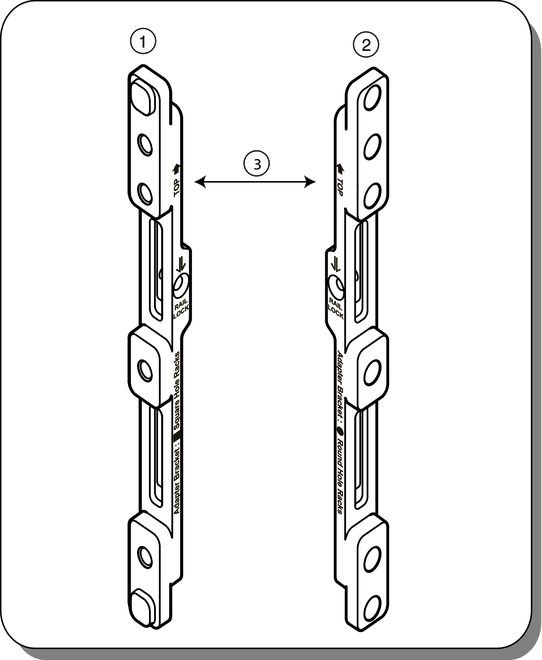 For 10-32 racks, use two 10-32 shoulder screws per side. 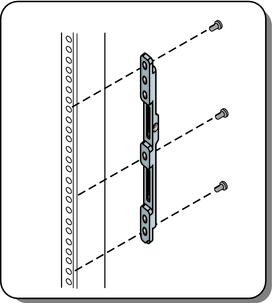 Attach upper rear braces (1) to the rack posts (2) directly above the adapter brackets, as shown in the following figure. Use either two M6 x 12 or two 10-32 x 10 screws (3) per side. Before tightening the screws, slide the braces (1) up as far as they will go. The holes on the braces are oval shaped so they can move a little up and down when the screws are loose. Remove the six screws (1) that hold the left and right shelf extenders (2) on the shelf rails (3), and then remove the shelf extenders. You must remove the shelf extenders before installing the server in the rack. They are used for other products. Place the shelf rails into the rack. 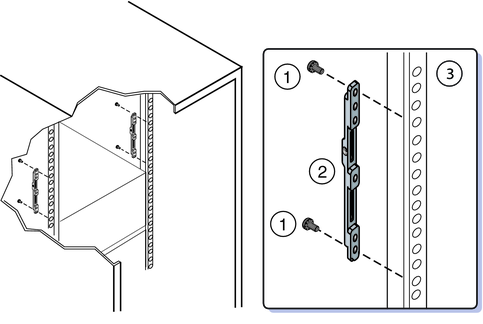 The shelf rails expand (1) to fit the rack, then slip into the slots on the adapter brackets (2), and drop into place (3). Caution - Drop Hazard! Be certain that the rails are firmly seated in the brackets before proceeding. Thread the four M4 X 10 flathead locking screws (1) into the adapter brackets. These prevent the shelf rails from accidentally lifting out of the adapter brackets.